Ex-Gov. 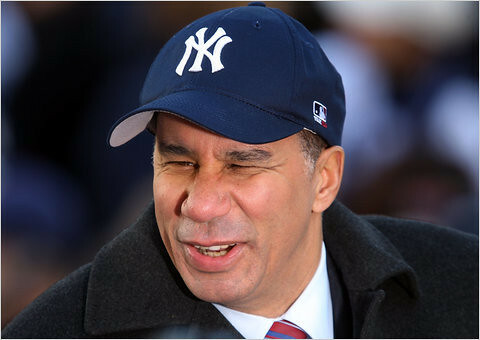 David Paterson decried this morning in a radio interview what he said was a lack of talented candidates running for public office, calling some “lower caliber” than when his father was in office or when he first started in the state Senate. “I think the best and the brightest are not going into government,” Paterson said told Fred Dicker on his Talk-1300 radio show. “What’s gone from Albany is nobody’s passionate about anything but personal gain,” he added. But Paterson also gave Assembly Speaker Sheldon Silver a pass on the corruption scandals have infested Albany and said that if he was governor, he wouldn’t seek to have the powerful Democrat removed from his leadership post. “Who could be around Albany for 20 years and not be accused of something,” Paterson asked rhetorically. In typical, unabashed Paterson fashion, the former governor then referenced his own ethical troubles from when he was in office, including his intervention on behalf of an aide who was arrested for domestic abuse charges. That wasn’t the only scandal that marred Paterson’s time as governor, an office that he assumed after Gov. Eliot Spitzer resigned in the midst of a prostitution scandal. In December 2010, Paterson was fined $62,000 for accepting World Series tickets from the Yankees and then lying under oath about how he got them. Now a professor at Touro College in New York City, Paterson was booted from his perch as a drive-time radio host last year. The radio show on WOR had been an occasional spot for Cuomo himself to call in and drop news in a relatively friendly setting. Paterson in the interview said he was “deeply jealous” of Gov. Andrew Cuomo’s ability to work with the Legislature and doubted the current governor would want to unseat Silver, who has been speaker since 1994. Dicker reported on Monday that Cuomo and his inner circle had discussed ousting Silver over the weekend and possibly install Assembly Majority Leader Joe Morelle. Cuomo’s office has stringently denied there’s any discussion to remove Silver. Paterson, the former Senate minority leader, was succeeded in that post by Sen. Malcolm Smith in 2007, who now is accused of orchestrating a bribery scheme to put himself on the Republican mayoral ballot. The former governor said he was perplexed by the alleged effort to pay off party leaders saying there was a legal way to do that anyway. “All of these things they wanted to do illegally they could have done legally,” Paterson said. Print article This entry was posted by Nick Reisman on April 9, 2013 at 11:22 am, and is filed under David Paterson. Follow any responses to this post through RSS 2.0. Both comments and pings are currently closed. It’s always amusing when the idiotic, accidental governor who did more than anyone in history to cement Albany’s dysfunctional image tries to paint the legislature as the only source of the problem. Word is he wants to run for Rangel’s seat, so maybe he’s just trying to keep his name out there until that opportunity arises. Since we all know he can’t cut it in the real world, guess he needs to land somewhere where taxpayers can again subsidize his irrelevancy – he’s burned in Albany, so maybe he can bring his shtick to DC.